@etty - Great to hear. Thank you! > @Todd - The first time you click Disable Operating System Upgrades it does always ask if you would like to restart. (Basically any time that clicking the button changes your settings from what they were when you first opened it will trigger the restart notification.) 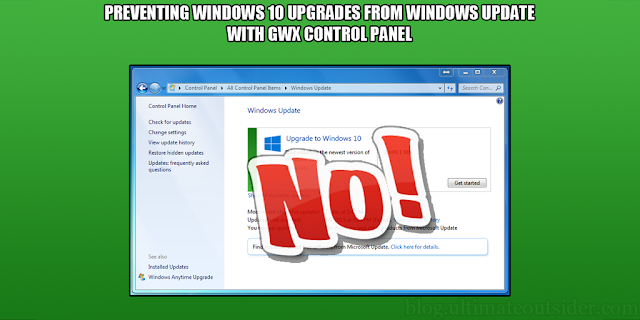 It's just a Yes/No dialog box, and if you click No, it will not restart Windows. This did show up the second time I ran the app. I was in native mode, not Go To Assist. Apparently something was in the buffer and thought I had clicked Okay the first time through as it instantly rebooted without even showing the reboot dialog. It could have been fumble fingers, but I don't think so. I distinctly remember clicking the Disable button and boom, I was rebooting. This would only be an issue when I am logged in remotely (Go To Assist) as I would have to called the customer back and ask them to log me back in. And I do plan to use this utility a lot with Go To Assist. Maybe you could look into a way to clear the buffer and/or prevent an accidental double click skip (mouse button bounce) before displaying the prompt? @Todd - Oh, here's your comment! I left a response to you on the original announcement page. I added a new feature that should help you avoid this situation. The /norestart command line switch. See the updated documentation for details. I have a small problem with the latest version. The program does everything it is supposed to do with one exception. When I change the windows update from "Install updates automatically", to either "never check....." or to "Check for updates but let me......." I keep on seeing the icon(Monitor) flashing and somehow the program is being over-ridden and the updates revert back to ,"Install updates automatically." Please help me as this setting causes problems for me when I do downloads over night as the updates install and close the PC down. When I wake up and check my PC , I have to start my other downloads all over again. It sounds like some other process is resetting your Windows Update settings, but I'd like to see if any errors are reported in the logs. First of all, many thanks for your very prompt reply to my comment. I have been away and was only able to check your blog today. OK. the program is still not permanently preventing auto updating of my windows 7 Ultimate PC. Please forgive my ignorance in the matter of where to go to find the "Save Diagnostics Info' report. I can't find it. I have read through the "User Guide" section rather hurriedly hoping to find the said guide highlighted but for some reason I just keep missing it. Can you please give me more specific directions as to the subheading or something that will help me. Other than the small problem as described above and in my previous post, the program is working like a charm.Thank you for your brilliant answer (GWX Control Panel) to the widows 10 challenge. Blessings. HOLD IT PAL.!!!! I have found the "save Diagnostics Info" report. It will be on its way as soon as I have posted this item. My sincere apologies for any inconvenience caused on my part. Bye for now. Also forgive any spelling mistakes as I am a one finger typist that can misspell words at times.Blessings. Thank you Ultimate Outsider for your promt reply, appreciated very much!! !